Cambodia Tours creates this adventure for those who have a week and would like to take in all the main highlights of this fascinating country. The combination of history, culture, architecture, countryside and coastal relaxation provides the opportunity to get under the skin of the country. Please contact our travel consultant for more details and the best offer. Price from: $1728 - Book now! Welcome to Phnom Penh, Cambodia’s vibrant and bustling capital city. Despite its recent turbulent history, Phnom Penh’s wide tree–lined boulevards and faded colonial mansions hold an undeniable charm. Upon arrival, your guide will meet you at the airport and take you to city center. Breakfast at the hotel, then check out for an intensive day. This morning, you will take an excursion to Cambodia’s infamous filling fields and also visit the Khmer Rouge’s grim Tuol Sleng S21 detention center (Genocide Museum) just outside the city. After lunch (your own account), your afternoon tour explores the city highlights including the Royal Palace, the spectacular Silver Pagoda and the National Museum which has an outstanding collection of Khmer crafts. Next, take a guided transfer to the Phnom Penh airport for your internal flight to Siem Reap. Upon arrival, you will be picked up by our guide who then escorts you to the hotel. After check– in, spend the rest of time at your leisure. Siem Reap is the provincial capital and gateway to the ancient Angkor temples. Recognized as a World Heritage Site by UNESCO, the Angkor Archaeological Park encompasses dozens of temple ruins including Bayon and the legendary Angkor Wat. Today, you will enjoy an entire day dedicated to discovering the mysterious Angkor temples. Wake before dawn and drive to Angkor Wat complex – the largest religious monument in the world at sunrise. Dawn is one of the most beautiful and haunting times to visit the temples and see Angkor Wat reflex on the water. After breakfast, our tour continues with visiting the jungle-covered temple of Ta Prohm which is a wonderful combination of human genius and natural beauty with its giant trees that have grown there for centuries. The temple became more famous after Tomb Raider was filmed there. You will have lunch at your own account. After recharging battery, you’ll continue your exploration by a stop at Preah Khan meaning “Holy Sword”. This is one of the largest temple compounds in Angkor and is defended by four concentric walls. The main shrine and its adjoining buildings are richly decorated with Buddhist motifs and scenes from Hindu epics. Drive further through the North Gate of Angkor Thom to see the enigmatic faces of Bayon Temple that’s known as the heart of Angkor Thom. You’ll also see the intricate base reliefs of the Terrace of the Elephants, Angkor Thom is filled with fabulous monuments on the way to get there. Once you reach the South Gate of Angkor Thom- the beautiful and old Gate with its majestic doors and artifacts, you’ll begin a tradition boat trip along the water way where history, nature and culture come alive. You can also see the beautiful sunset at Great wall. On the way, stop at Prasat Chrung temples located at the southeastern corner of Angkor Thom and they are dedicated to the Bodhisattva Lokeshvara (Avalokiteshvara). The uneasy access there keeps Prasat Chrung remain untouristic and pretty charming. From this point, you’ll enjoy the best sunset. Return later to the hotel and the rest of time is at your leisure. Uncover the secrets of authentic Khmer cuisine in a half–day cooking class in the village. Here is the chance you will learn about Cambodian vegetables, herbs, and other ingredients to make its unique cuisine. Join the classroom for a hands–on culinary experience to enjoy for lunch. Return to your hotel and relax for the rest of the day. Optional tours ( extra charge): You can make your afternoon more memorable with the panorama tour to see Angkor’s amazing temples and sights from the sky, choosing between Hot air Balloon or Helicopter tour. Please contact our travel consultant for more information. This morning, our driver will transfer you to the airport for your flight to Sihanouke Ville, where the sandy beaches and untouched islands are waiting. Sihanoukville also known as Kampong Som, is a province in southern Cambodia on the Gulf of Thailand. 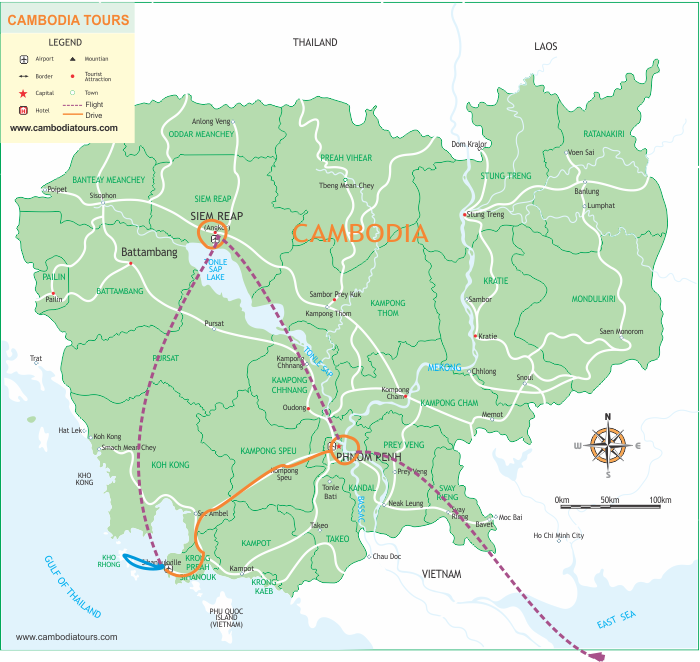 This port city is a growing Cambodian urban center, located 226 kilometres southwest of the Cambodian capital, Phnom Penh, excellent road, 3 ½ to 4 hours’ drive. Time to relax at your hotels or on beach. Lots of water activities available such us swimming and sunning, trips to the islands, scuba diving, fishing, and snorkeling… Please contact us for better consultation! Accommodation: Hotel in Sihanouke Ville. Day 6: Sihanouke Ville – Free at leisure. Spend another day relaxing on a beach or doing an excursion, taking in the beautiful surrounding area. You are free until our private car/ van transfers you back to Phnom Penh Airport for departure flight back home.